As I mentioned in the Salted Caramel Shortbread Bars post, Chinet sent me a huge box of their new disposable bakeware to test. The box included sets of their square, rectangular, large oval, and small oval sizes. If you’re like me, most of the baking you do is for other people–coworkers, parties, bake sales, baby showers, wedding showers, etc. That often means baking in one dish, transferring to another container for freezing and transporting, then not getting the container/lid back after the party. This Chinet Bakeware solves that problem! I baked, sliced, and transported my bars without having to use multiple containers. And when the bars were gone, one of my coworkers simply threw the container away. Also, the bakeware is made of 90% recycled materials and is non-stick and disposable. And, it can go from oven to table to freezer to microwave resulting in less dishes to wash and a very happy baker! In fact, I can’t wait to use these next weekend when I start baking for my friend’s baby shower. The only negative I found was that when I sliced the bars in the bakeware, the pan’s shape got a little messed up which made getting the lid on a little tricky. But once I pushed it back into shape, all was good. 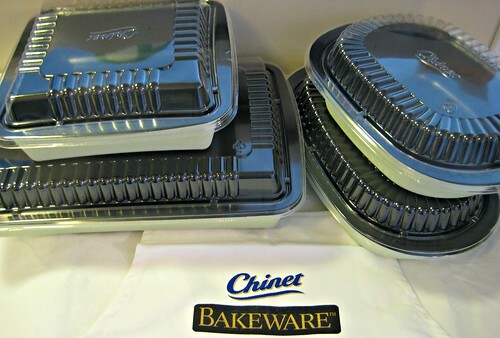 And because the folks at Chinet are so awesome, they are letting me give away a complete set of Chinet Bakeware to one of my lucky readers! Simply leave a comment below stating what you would make in the disposable bakeware. Chinet provided me with a complete set of Chinet Bakeware and will ship a second set directly to a winner. Giveaway ends at 11:59 p.m. EST on Thursday, May 5, 2012. One winner will be selected at random shortly thereafter and contacted by email. 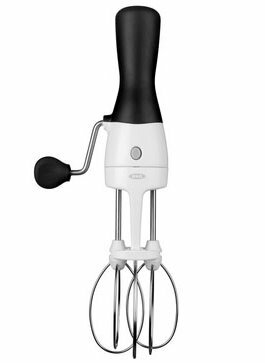 Please note this giveaway is only open to residents of the U.S.
As I mentioned in in my Brown Sugar Cupcakes post, OXO provided me with an additional egg beater to give away to a reader and now is your chance to win it! This egg beater is perfect for those times you have to mix a few ingredients but don’t want to break out the stand mixer. Plus, not only is there a non-slip grip for people like me that constantly wash their hands while baking, but the beaters are super easy to clean–each beater can be removed separately and the base detaches and can go in the dishwasher. To enter to win your own egg beater, leave a comment telling me about your favorite kitchen tool. OXO provided me an egg beater for myself and one reader. Giveaway ends at 11:59 p.m. EST on Sunday, January 29, 2012. One winner will be selected at random shortly thereafter and contacted by email. Please note this giveaway is only open to residents of the U.S.
On January 1, I began counting points (again). For those of you who have no idea what points are, consider yourself lucky. Not only does counting points mean I eat a lot less of everything I make (fortunately I have coworkers willing to inhale everything I bring in), it also means a return to stocking my kitchen with lots of fruits and veggies and healthier snacks. And that includes Pop Chips. Not only are they delicious, they satisfy my chips craving and have less than half the fat of fried chips. Plus, my favorite flavor (sea salt & vinegar) is only three points for the 100 calorie single serving bag. They’re also giving away a month’s supply of Pop Chips every week. And, just by entering, you receive a $1.00 off digital coupon. Rules & regulations. 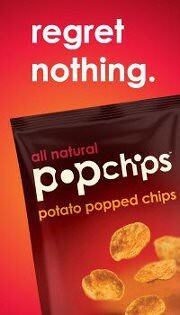 To enter to win the Pop Chips, leave a comment below telling me your favorite Pop Chips flavor. To enter to win the Vegas trip, visit Pop Chip’s Facebook page. Pop Chips provided me chips for myself and one reader. Giveaway ends at 11:59 p.m. EST on Sunday, January 15, 2012. One winner will be selected at random shortly thereafter and contacted by email. Please note this giveaway is only open to residents of the U.S.
Two years ago I lost my friend Patti (my age–only in her 30s) to cancer. Watching her go through treatments, try different medications, and see her in pain was one of the absolute worst things I have ever witnessed and I can’t imagine a child going through what Patti went through. So, when I heard that one of my favorite brands, OXO, was donating up to $100,000 to Cookies for Kids’ Cancer to support research for new and improved therapies, I knew I had to participate. Background: Cookies for Kids’ Cancer was founded by two OXO employees whose own son was battling pediatric cancer. When the couple learned that the main reason over 25% of kids diagnosed with cancer do not survive was because of a lack of effective therapies, the organization was started. For more information, visit OXO’s Cookies for Kids’ Cancer. 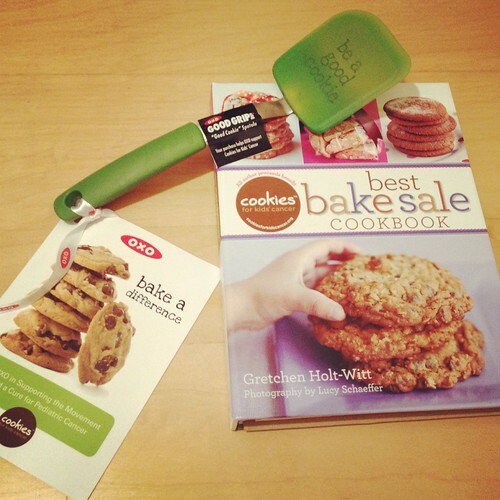 How you can help bake a difference: Purchase a limited edition cookie spatula! For every spatula sold, OXO will donate 50% of the profits (up to $100,000) to benefit pediatric cancer awareness. These spatulas can be found at Bed Bath & Beyond and Amazon, as well as other retailers. 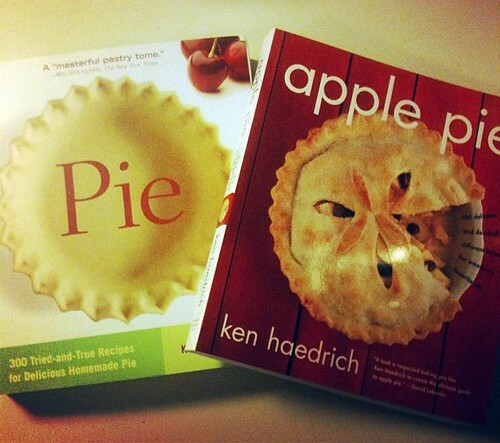 As promised, here’s your chance to win your own copies of these fabulous pie cookbooks from Harvard Common Press. Everything in these cookbooks looks amazing, and the pie crust recipe I used for my salted caramel apple pie was so incredible that everyone who tasted it has been talking about it since Thanksgiving. It’s that good. To enter to win the cookbooks, tell me what your favorite kind of pie to bake is. Giveaway ends at 11:59 p.m. EST on Thursday, December 1, 2011. One winner will be selected at random shortly thereafter and contacted by email. Please note this giveaway is only open to residents of the U.S. and Canada.